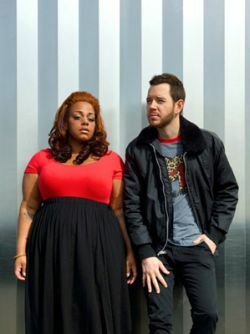 Fly Moon Royalty is comprised of soulful vocalist, Adra Boo and DJ/Producer/Emcee Action J. While their backgrounds couldn’t be more different, the musical partnership of Fly Moon Royalty came about naturally. Often likened sonically to Janelle Monae, vocalist AdraBoo’s roots are planted firmly in musical theater. “I started to step out and sing in highschool – I got into theater, and whenever there was a musical, I was in! I learned the ins and outs of the stage, and went on to attend a theater training program, and then, through friends in the club scene, I started hosting.” Enter second half of the duo, Action J – a Grand Rapids, MI local and newcomer to Seattle, the all-round MC/DJ/producer threw himself into DJing straight after high school. “Ultimately, I just wanted to make beats. I had no mentors or anyone at all that could teach me, so I bought myself an MPC 2000 and taught myself how to sample. It wasn’t until I was taking a music program at the community college that I discovered my love for the piano. Before that moment I didn’t even know what Middle C was on a piano.” And this year Moisture Festival Burlesque has them … Yeah!